That email is sitting in your inbox. You know the answer to the question it’s asking, but those two words are still haunting you: “please advise.” It can show up in the subject line, somewhere in the middle of a message, or, most frequently, right before the signature at the end of the email. But what do you do with it? The good news: if you know the answer to the main question in the email, just write your reply and boom! You’ve “advised.” At the most basic level, “please advise” is a request for advice or answers. But to some people, it can come across as redundant, stuffy, or passive aggressive. Please advise: What does “Please advise” mean? Can you give me your thoughts, answers, or input? As you can see, “please advise” can be interpreted in a variety of ways. Its primary meaning is a request for information, but it can also come across as having one of those last two meanings—and that’s not so pleasant. It all depends on context. The way readers interpret “please advise” depends not only on what the message is about but also on the tone of the rest of the message. In most cases, this confusion can take place when “please advise” appears as the end of an email. These example emails give a sense of the different ways “please advise” might come across to a reader. I was hoping you could help me go over the training decks. You were the last person to give these trainings, so I’d appreciate some background on the order and how the exercises are supposed to work. I know you’re swamped, but can you let me know whether it’s okay to move forward with publishing the article? Hoping to get it up mid-week. In Eric’s email, which already seems passive aggressive, the “please advise” at the end is the bitter cherry on top. Jennifer’s email, on the other hand, tries to be polite, even though Jared has clearly caused some delays. That’s right: the best way to get around “please advise” is just to leave it out. In most cases, the phrase comes after a question, so it ends up functioning as filler words or worse, as in Eric’s email. In the second example email above, the “please advise” doesn’t necessarily come across as rude, but it’s also not strictly necessary. Here’s a crazy idea: if you’re writing an email asking for information, advice, or ideas from a colleague, they’ll see your request in the body of the email. They already know they’re supposed to get back to you with answers, with or without the “please advise” tacked on at the end. So, if your message feels complete without “please advise,” just ask your question and leave it at that. Another potential problem is the difference between advise and advice. 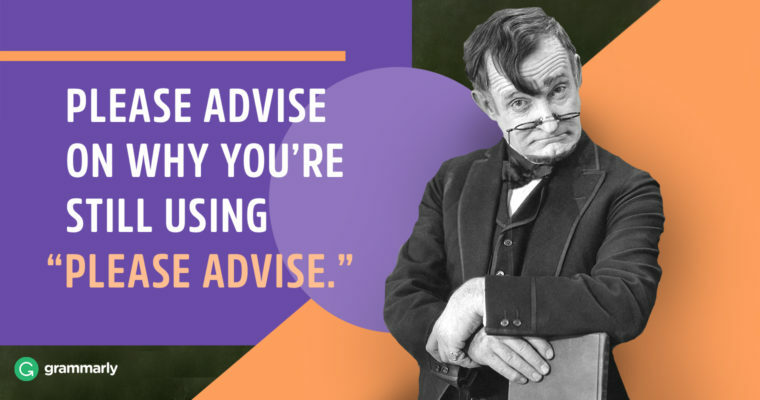 Advice is a noun, meaning “suggestions for what to do,” and advise is a verb meaning “to give advice.” Mix up your s and your c and you’ll need advice on your spelling, as well as on the question you’re actually asking. In the end, there’s nothing grammatically wrong with “please advise.” It’s just a question of usage and style. Some people don’t like it because it can be interpreted as rude or demanding. Other people think it’s redundant: just ask your question and call it a day. If you like the formality of “please advise,” go ahead and use it. But first, just make sure the rest of your email doesn’t seem impolite. That will keep your emails clear and courteous no matter what. Whether or not you wanted us to advise, that’s advice you can live by.